Abbott stated at a meeting Nov. 17 that he does not want more toll roads established in the state, and said there are other ways to secure funds for infrastructure. Two months ago, TxDOT announced plans to expand I-35E and install “managed lanes.” According to the agency, these refer to tolling lanes that are dynamically priced and would keep traffic moving at 50 mph. 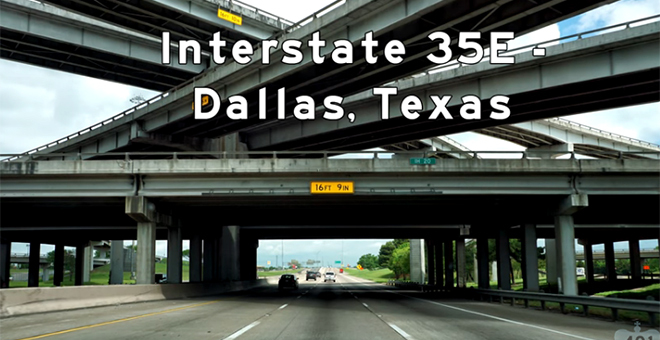 I-35E is half of a loop and runs through the Dallas area. It is mirrored by I-35W, which runs through Forth Worth. “Members of the Texas Transportation Commission and TxDOT staff have been in regular contact with the governor’s office over the past several weeks, and we understand the governor’s expressed desire to not include new toll roads,” TxDOT spokeswoman Hanna De Hoyos said. The Texas Transportation Commission is the five-member governing board that oversees TxDOT. De Hoyos confirmed that the commission met in Austin on Oct. 25 to discuss 17 potential major projects in the state that were developed locally and brought forward by area metropolitan planning organizations. The commission intends to drop toll-related projects from its upcoming plans. “The Texas Transportation Commission fully understands and is committed to continue to use the funding from Proposition 1 and Proposition 7 for non-tolled projects,” commission Chairman J. Bruce Bugg Jr. said. Proposition 1, voted on in November 2014, is an amendment directing that a portion of oil and gas tax revenues be deposited into the State Highway Fund. Proposition 7, voted on in November 2015, outlines how some revenue from both the state’s general sales and use tax and the motor vehicle sales and rental tax is dedicated to the State Highway Fund for non-tolled projects. John Esparza, president of the Texas Trucking Association, said increasing the gas tax could be one solution to boosting revenue that could replace additional tolls. Esparza said Texas has not changed its gas tax since 1991, when the state’s population was significantly smaller than it is now. Esparza suggested the trucking industry generally supports an increased gas tax, which he said would improve the state’s revenue. De Hoyos also said that TxDOT is in the midst of a public comment period for the 2018 Unified Transportation Program update. That program authorizes projects for construction, development and planning activities, and includes projects involving highways and public transportation. “In response to public comments received, we are developing a plan to scrub the UTP update of any toll roads in the proposed revisions,” De Hoyos said. Texas’ tolls vary in cost depending on location and size of vehicle. For example, a toll plaza on state Highway 45 near Austin charges a 2-axle vehicle with TxTag stickers $1.07 and a 4-axle vehicle $3.21. The TxTag system is a TxDOT program that works like a pre-paid phone plan, allowing vehicles with electronically scanned TxTag stickers to move through tolling locations quickly. According to the TxTag toll calculator, it would cost the driver of a 4-axle truck $15.93 to drive from Austin to Dallas. Esparza commended Abbott on his declaration to avoid future tolls, stating that tolls were substantially more expensive for trucks than passenger cars.